Tomorrow is the big day, turkey day :) Friday mom and I are hitting the stores for Black Friday shopping, and then Friday night when I'm just about ready to crash from a shopping marathon Scott, Ethan and I put up the tree. Just the lights so that Saturday I'm ready to go with decorating the house from top to bottom. We did the outside lights this past weekend. Today I wanted to share with you what I worked on over the weekend. They are my tags for my December Daily album. I'm working my way backwards with the dates and still have more to go (lots more). 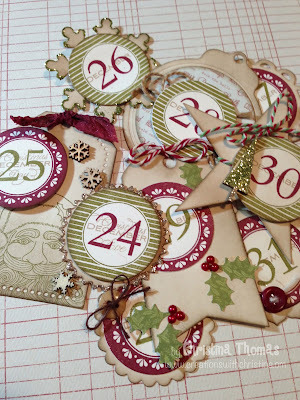 I'm using the December Countdown stamp set from paper trey ink and stamped them out using Scarlet Jewel and Ripe Avocado ink. I alternated the colors and the wreaths so each one looks a little different. Then I cut out a whole bunch of different die shapes using PTI dies in vintage cream cardstock which I inked with walnut stain ink and I'm using to make my tags. Here are my Christmas Eve and Day tags. 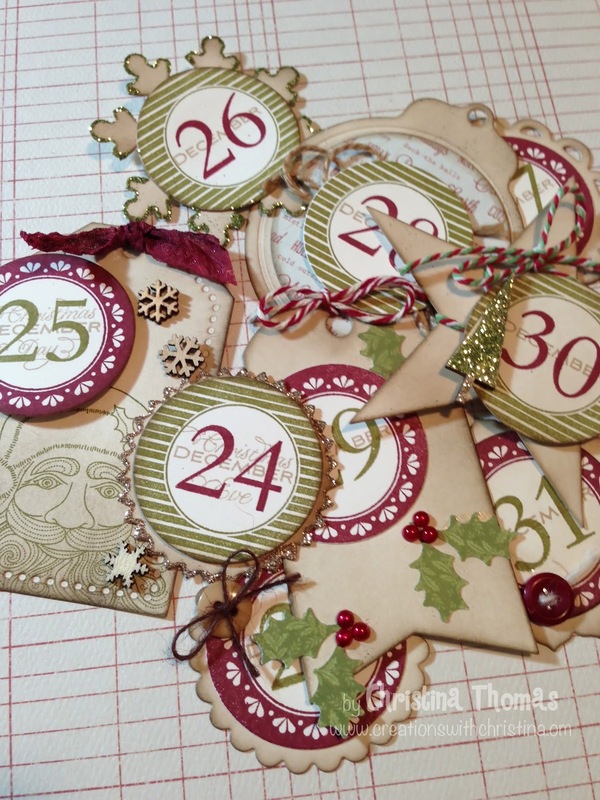 I stamped out December in PTI kraft ink on all the tags and also added to these the Christmas Eve and Day stamps. For the 25th I used Tag Sale #3 die, added some seam binding that I dyed to match the scarlet jewel ink color, some snowflake wood veneers, and then stamped Santa using the Santa Stationary stamp set also from PTI. 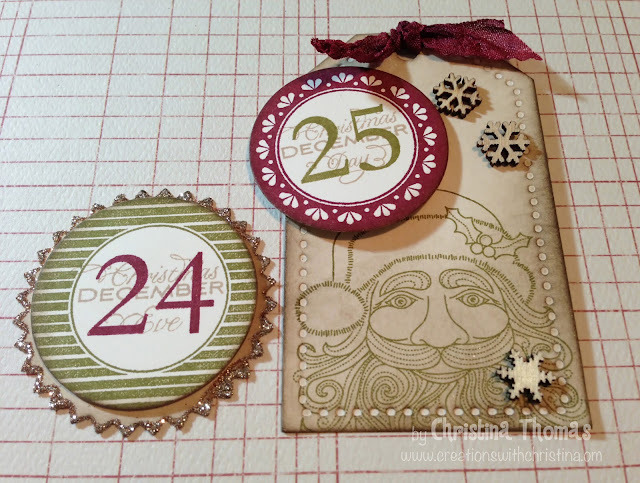 The 24th is a real simple look with just some glitter on the edges of the die cut. Here is a picture of all the ones I got done so far. Still have lots more to do and hope to get a little time in my room today after I drop Ethan off at school and hit the grocery store. Have a great day everyone. I probably won't have any other finished projects this week as the rest of the week will be spent with family but I'll be back next week. Beautiful tags! You always give me inspiration! Absolutely Beautiful! Have a great Thanksgiving and fun with Black Friday. My experience doing that 3 years ago wasn't so good. Someone took a package right out of my cart while I was standing right there! Californians...what can I say? Oh wait, I'm a native so I better be nice. These are absolutely gorgeous, Christina. I am truly inspired. Your tags are so pretty Christina, hope you and your family have a lovely Thanksgiving!! Happy Thanksgiving and thanks for taking the time to share. I love the colors and vintage feel of your tags. They are a great starting point for your journal. Enjoy shopping and spending time with family over the next few days. Your numbers came out beautiful! I love how you put glitter or stickles (?) on the edges of some. I'm off to order some of those ink colors. Thanks for sharing and i look forward to seeing more of your DD. Your tags ate great, thanks for sharing! These are wonderful, can't wait to see finished project! Hope your Thanksgiving was wonderful.